​KANSAS CITY, Mo. - Northwest Florida State College's Chris Duarte earned honors as the NABC NJCAA Player of the Year powered by ShotTracker, heading the 2019 All-America teams for the National Junior College Athletic Association (NJCAA) announced today by the National Association of Basketball Coaches (NABC). Duarte, a sophomore from Puerto Plata, Dominican Republic, led coach Steve DeMeo's Raiders to a fifth straight FCSAA Panhandle Conference championship with a 28-5 won-lost record. The 6-6 guard, who has committed to the University of Oregon, registered 10 double-doubles this season while averaging 19.0 points and 7.1 rebounds per game, connecting on 54 percent of his field goal attempts. After leading his team to the Division I championship in the National Junior College Athletic Association (NJCAA), Vincennes (Ind.) University head coach Todd Franklin is the recipient of the 2019 NABC NJCAA Coach of the Year Award presented by Wilson. Franklin, in his ninth season as head coach of the Trailblazers, guided his team to an 87-77 win over Ranger Junior College in the NJCAA championship game in Hutchinson, Kan. The win was the fourth in Vincennes history and the first since 1972. In leading his team to the title with a 34-2 won-lost record, Franklin elevated his overall won-lost record to 602-138, a winning percentage of .812. Franklin will receive his award on Friday, April 5, at the annual Hillyard Champions luncheon in the Marquette room at the Hilton Minneapolis Hotel. The event begins at 12:30 p.m. CT during the annual NABC Convention and NCAA Men's Final Four. The veteran coach will also be honored with a NABC Honor Award for 600 career wins on Sunday, April 7, at the annual AT&T NABC Guardians of the Game awards show in Minneapolis, Minnesota. The event begins at 6:30 p.m. at the Main Auditorium at the Minneapolis Convention Center during the NABC Convention and NCAA Men's Final Four. The show will be broadcast by Stadium(https://watchstadium.com). 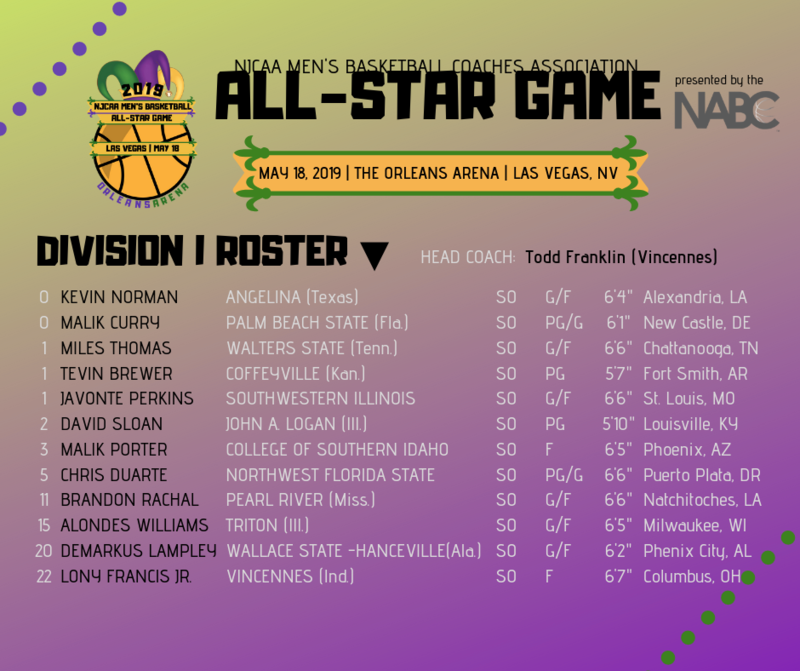 Sponsor NJCAA All-Star game, featuring 24 players and 3 coaches. Provide housing, apparel package and meals. Provide Hall of Fame rings. Provide Coach and Player of the year awards. Provide a voice to the NJCAA Board of Directors and national office on issues pertaining to the student-athletes and coaches. Provide a coach for USA Basketball trials. Communication with other organizations to for the benefit of better basketball.